Some time back, I created a series of webcomics about two dudes I called The Tweets. It was inspired by a news story about young people trying to make a living by selling themselves, and their Twitter personas, to companies and politicians for Twitter campaigns. I resurrected the guys as we begin to wind down the official cycles of the Making Learning Connected MOOC. You can view the comic as embedded here or go directly to the comic at Stripgenerator, the site where I made the comic. And heck, while you are there, make your own …. 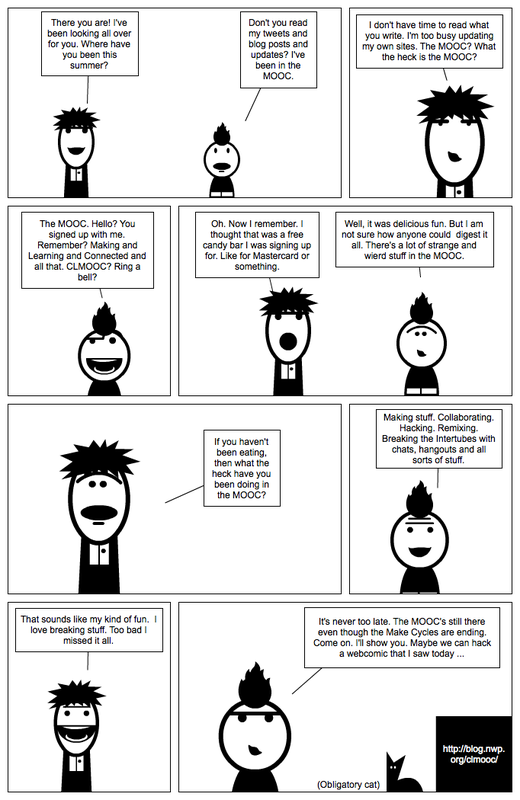 This entry was posted in comics and tagged #clmooc. Bookmark the permalink.